How extensive is the fire protection system in your business? How extensive is the fire protection system in your business? While it’s easy to think that all fire protection systems are created equal, this is a simple mistake to make. Active and passive fire protection are two types of these systems that you need to ensure are kept well-maintained in your business. Here is some more information about both of them. Fire sprinkler systems, fire extinguishers, and fire alarms are all vital components of your active fire protection systems, also called AFP. 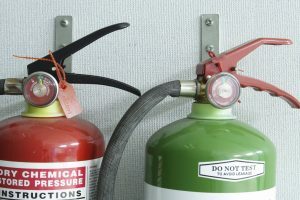 These all need to be activated whenever a fire breaks out, although sometimes they need to be operated by a user instead of automatically responding. Smoke and fire alarms, and for that matter, carbon monoxide detectors, are all useful pieces of technology that will tell everyone in your building that they need to evacuate to safety. Running fire drills in your workplace can help you determine how functional your active systems are. Passive fire protection systems are also called PFP. While active systems can contain and control fires that break out, and eventually extinguish them, passive systems help out by giving everyone in the building more time to evacuate by slowing the spread of the fire and the smoke that comes with it. Firewalls, Firestop technology, fire doors, and fire dampers are all crucial parts of an effective and comprehensive passive fire protection system. It’s essential to have both active and passive systems in your commercial building. Having your fire protection partner inspect and maintain both active and passive systems means that they will work when it counts – during the next fire-related emergency. Sprinklers need to have adequate amounts of water pressure, even if they are water mist-based systems. Fire alarms need to have batteries replaced, and fire extinguishers need to be recharged after every use, even partial ones. It’s also important to make sure that you have both systems installed and operational, because it’s entirely possible for there to be problems in installation, especially when it comes to passive systems, that you won’t notice until it’s too late. The two systems can work together to overcome any problems or unexpected shortcomings that prevent the other system from being fully effective. This entry was posted on Friday, January 25th, 2019 at 12:00 pm. Both comments and pings are currently closed.